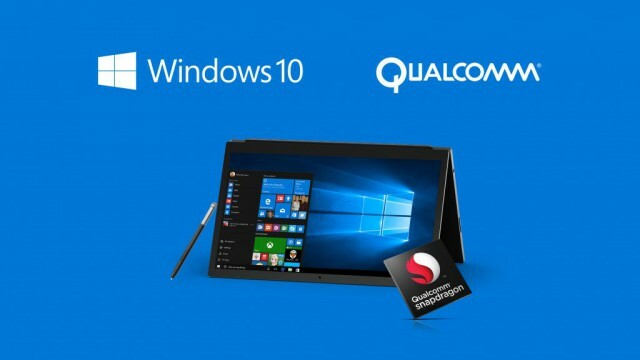 Microsoft and Qualcomm announced late last year that Windows 10 will be available on ARM-based Snapdragon devices. And, unlike with Windows RT, this time around x86 programs are welcome, giving users the ability to run full-blown software like Office 2016 and Adobe Photoshop CC. And now Microsoft and Qualcomm have provided an update on the project, announcing the hardware partners that will release ARM devices with Windows 10 and the sort of benefits that users can expect to receive from the "Always Connected PCs" that will arrive. The first Windows 10 devices powered by Snapdragon chips will come from ASUS, HP, and Lenovo, according to Qualcomm, and they will be powered by the Snapdragon 835 mobile platform, which is also at the heart of Android flagships like the Samsung Galaxy S8 and the upcoming OnePlus 5. "Each company is set to produce sleek, thin and fanless PCs running a Windows 10 experience with unparalleled LTE connectivity for an always connected, on the go experience. Coupled with the incredible 10nm leading node efficiency of the Snapdragon 835 Mobile PC Platform, these devices will feature beyond all-day battery life," says Qualcomm. The major benefit that Qualcomm's chips provide, over a traditional x86 platform, is the superb cellular connectivity. The company has worked hard in the mobile market to provide fast transfer speeds and low power consumption, both of which can greatly benefit on-the-go users of Windows 10 as well. Microsoft adds that "great battery life" will be a given with the ARM-based Snapdragon devices with Windows 10. That is as I suspected when I analyzed the benefits of the ARM architecture on Windows 10 devices. But, as far as performance goes, we will have to wait until the first devices hit the market to see how they fare against similar Windows 10 devices with Intel or AMD chips. Qualcomm says that the Snapdragon 835 chip will have a Kryo 280 CPU, Adreno 540 GPU and Hexagon 682 DSP as well as a Snapdragon X16 Gigabit LTE modem, which offers download speeds of up to 1Gbps over cellular networks, and support for 2x2 Wi-Fi 802.11ac MU-MIMO for Wi-Fi connectivity.